My great-grandmother was adopted, but that was never one of our family's mysteries. She knew she was adopted from the age of 18 but had never wanted to know anything about her birth parents. The story from my grandmother goes that she and her mother, Isabelle E. Fitzgerald (Marchel), had been in a fight and in anger she blurted out to 18 year-old Cecelia that she was adopted. Unlike her mother, my grandmother has always wondered what had happened, where her mother had come from. Cecelia had told her that she was adopted from a Catholic baby home in Portland, Oregon that had burned down so there were no records. Knowing enough of my great-grandmother, however, I suspected that could have been a lie, something that was said so my grandmother wouldn't ask anymore questions. I never pursued this avenue much because regardless of who she was born to, Cecelia was raised in the (very) Catholic home of John, the son of a Polish immigrant, and Isabelle, the daughter of an Irish immigrant. Recently, however, my grandmother came to me wanting to see if there was any way to get more information about Cecelia's birth parents. My first path led to a dead end. I went to the Oregon State Archives in Salem to look up the information in the publication "Oregon Laws". Between the years 1864 and 1918 name changes were required to be reported by the county judge each year and subsequently were published biennially. However, after searching all years between 1912 and 1918 I did not find the name of either my great-grandmother or her parents. Needless to say, that left us a little dejected.Though, I still hopeful I would be able to find yet another avenue. 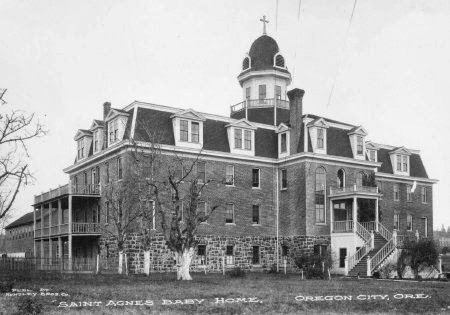 Searching generically about Catholic baby homes around the time frame led me to the Saint Agnes Foundling Asylum near Oregon City. While searching for more information about the Saint Agnes home, that led me the Catholic Charities in Portland. Saint Agnes either burnt, or had just become run down, but if the Catholic Charities handled the adoption, there was a good chance that they still had records. I contacted them, and indeed they had some records. I cannot get the name of her birth mother from them still because of Oregon Law, but it was noted that the law may change in the next year and that information would no longer be sealed. Even though I don't have her name, I know that the mother was from Josphine County, Oregon. This poses yet more questions -- Josephine County is on the Oregon-California border some 250 miles from Oregon City, where was Cecelia actually born? Was the mother sent away, was she living in Portland, or was the baby sent away? One of the documents was the letter in which the mother gave up all parental rights, which was done in May 1914. At this time the baby was unnamed. This gives way to the question of if the mother had second thoughts -- Did she try to find a way to raise the child in her first two months? At the time of Cecelia's first marriage her parents had written to the Mother Superior asking information about the birth parents on behalf of the priest. He had wanted to know if the mother was unmarried, their names, and if they were Catholic. So, it is likely Cecelia's parents were aware of the mother's identity. According to the Mother Superior's response, the father was unknown. So it seems most likely she was given up as a child born out of wedlock as opposed to the mother being widowed. (Once again, the mother's name had been withheld to us.) Is it possible the church they were married at would have this information? And so it seems this path has yet to come to an end and instead has created even more questions. Thank you Dr. Bill :) I am looking forward to being part of the Geneabloggers community, I have been lurking for awhile now. Welcome to Geneabloggers. This is a great blogging community. I've been a member for about six months. Presently, I'm doing Civil War Research and posting about it on my blog. welcome to geneabloggers, looking forward to reading more of your posts.